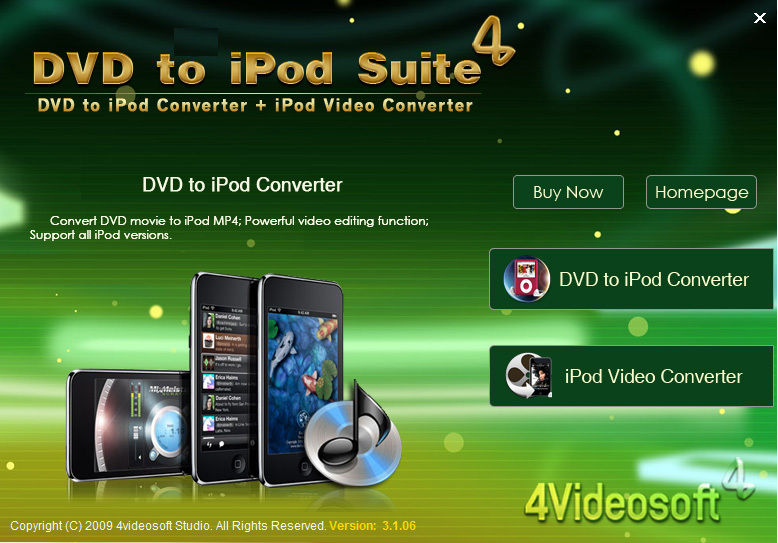 4Videosoft DVD to iPod Suite comprises two best iPod Converter: DVD to iPod Converter, iPod Movie Converter. This iPod Converter is one discounted converter for you to put DVD to iPod, DVD to iPod Touch, iPod Nano, iPod Classic, even converting DVD to your iPhone, Apple TV supporting MP4 video format. It can convert all video formats like MPG, MPEG, MPEG2, MTS, M2TS, TS, VOB, MP4, M4V, RM, RMVB, WMV, ASF, etc to MP4, H.264/MPEG-4 AVC(.mp4), MOV. comprises two best iPod Converter: DVD to iPod Converter, iPod Movie Converter. ...... MPEG, MPEG2, MTS, M2TS, TS, VOB, MP4, M4V, RM, RMVB, WMV, ASF, etc to MP4, H.264/MPEG-4 AVC(.mp4), MOV format for your iPod/iPhone. The editing functions are also available for you to optimize the output video, including trim, crop, merge, effect, take snapshot, etc. DVD to iPod converter transcodes DVD to iPod Format, quickly and accurately! It can rip DVD to iPod video MP4 and convert other video formats to iPod video. Qweas is providing links to 4Videosoft DVD to iPod Suite 3.3.36 as a courtesy, and makes no representations regarding 4Videosoft DVD to iPod Suite or any other applications or any information related thereto. Any questions, complaints or claims regarding this application 4Videosoft DVD to iPod Suite 3.3.36 must be directed to the appropriate software vendor. You may click the publisher link of 4Videosoft DVD to iPod Suite on the top of this page to get more details about the vendor.